Great Space Adventures Day (Calendar of Events). Great Space Adventures is sponsored by Senator Debbie Stabenow and Congresswoman Lynn Rivers in cooperation with the Michigan Space Grant Consortium and the University of Michigan. Hands-on activities include rocketry and balsa wood gliders which generate much excitement from our young participants as the count down nears blast off! Our NASA astronaut will present his very own space adventures to capture the fascination of both parents and children alike. Informational booths, such as Michigan Space and Science Center, University of Michigan Student Space Activities, and NASA Glenn Research Center (to name just a few) will reach many of our visitors. The goal of these events is to bring the excitement of science and math in general and Space research in particular to life for children in a family-focused event. This event is free. The year 2002 Great Space Adventures Day will be held in the EECS building (on the North Campus of the University of Michigan, Ann Arbor Michigan). This will take place Sunday October 6th, 2002 from 12 noon to 5:00 PM. Directions to the EECS Building. For more information call (734) 764-9508 or e-mail . Both photographs were taken by Bonnie Bryant, Administrator for the Michigan Space Grant Consortium. 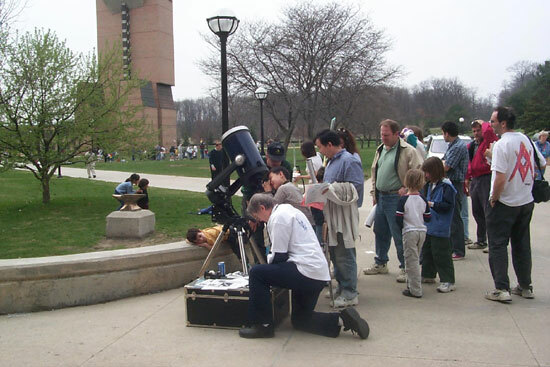 The first photograph shows visitors looking at sunspots during the April 20, 2000 Great Space Adventures Day. 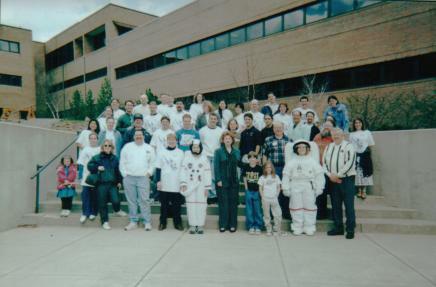 The second photograph shows some of the participants in the April 18, 1999 Great Space Adventures Day.